Yoga accessories can benefit both newbies and experienced yogis. Whether you’re trying to increase your flexibility or give yourself more of a challenge, check out our favorite yoga tools that will improve your yoga experience. Everything from belts to blocks to even socks can improve your form, stance, and grip. Whether you need something to help stabilize your body during a challenging pose or you want a tool to help achieve an even deeper stretch, we’ve got something for everyone. So grab your yoga mat and be sure to find an accessory (or two) from our list below! Yoga straps are used not only for holding various poses, but also for increasing your flexibility by deepening your stretches. With the REEHUT Yoga Strap, you have the option to choose between a 6, 8, or 10-foot strap that’s sturdy enough to give you the necessary support for your balance. Can’t pull your foot behind your head? Can your one-legged pigeon pose use a little help? A strap can make these moves (and more) easier for you to achieve. Just adjust the strap depending on the pose, place it around your foot, leg, or arm, and complete your move! By adding that extra length and/or range of motion, this strap will help beginners prepare for advanced poses by helping you build your flexibility and strength. The REEHUT can also be used for physical therapy since it does such a good job at helping you stretch. If you’re looking for strap that focuses solely on stretching, complete with grip loops, check out the Vive Stretch Strap. Just as the REEHUT strap can help you achieve those difficult positions, the Yogree Yoga Block can help you reach the right poses. By using this block, beginners can prepare for the real position while injured yogis can still practice without making their injury worse. Even those who are experienced can benefit by exploring different poses. This block will help you during your yoga sessions as well as in the long run by bettering your flexibility! Just place it on the ground and put your hands or feet on the top. You can also use it to support your head or neck when lying down, or you can use it to balance your center of gravity while sitting, standing, or squatting. 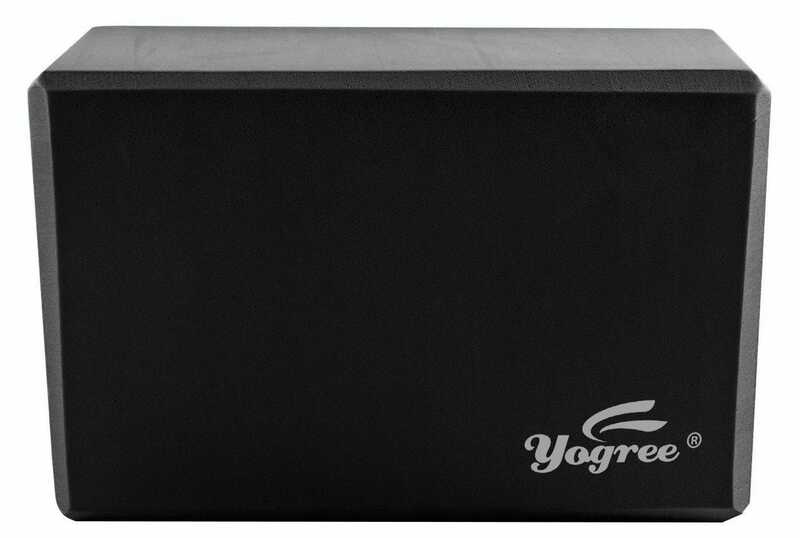 The Yogree is made of a sturdy, high-density foam that is durable and lightweight. Plus, the corners have slanted edges that allow for a non-slip, easy grip—even if there’s sweat! If you want to stay in certain positions longer and with more support, the yogree is a great yoga block pick. A close second is this cork JBM Yoga Block, which comes with a yoga belt but is a little more expensive. 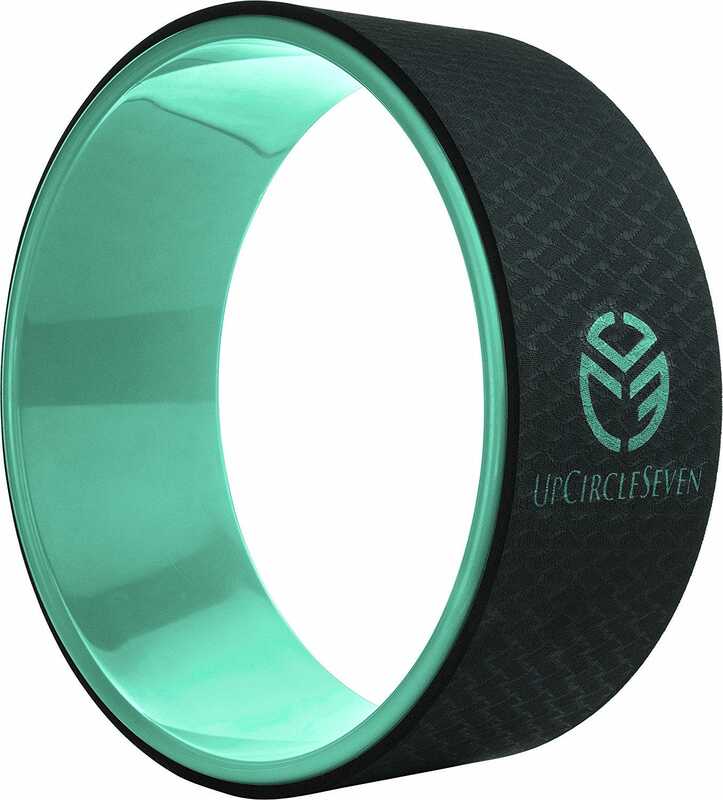 Whether you haven’t perfected your backbend, you want to stretch out your back, or you’re ready to try new yoga forms, the UpCircleSeven Yoga Wheel can help. This yoga wheel, which is made out of a non-flexing PVC material lined with a thick outer padding, can withstand up to 550 pounds. Lie on top of the wheel to open up your chest, relieve back pain, and even reach those difficult poses. Not sure what poses you can achieve with this wheel? The UpCircleSeven comes with a guide that includes 18 poses, so you’ll know where to start. It’s not just for your back, either! You can develop your core strength by placing your feet on the wheel while in a pushup position. Even increase your overall blood circulation by doing an inversion pose (with your feet in the air, holding the wheel with your hands). Yoga balls are great if you’re looking to strengthen your core and assist with your balance. 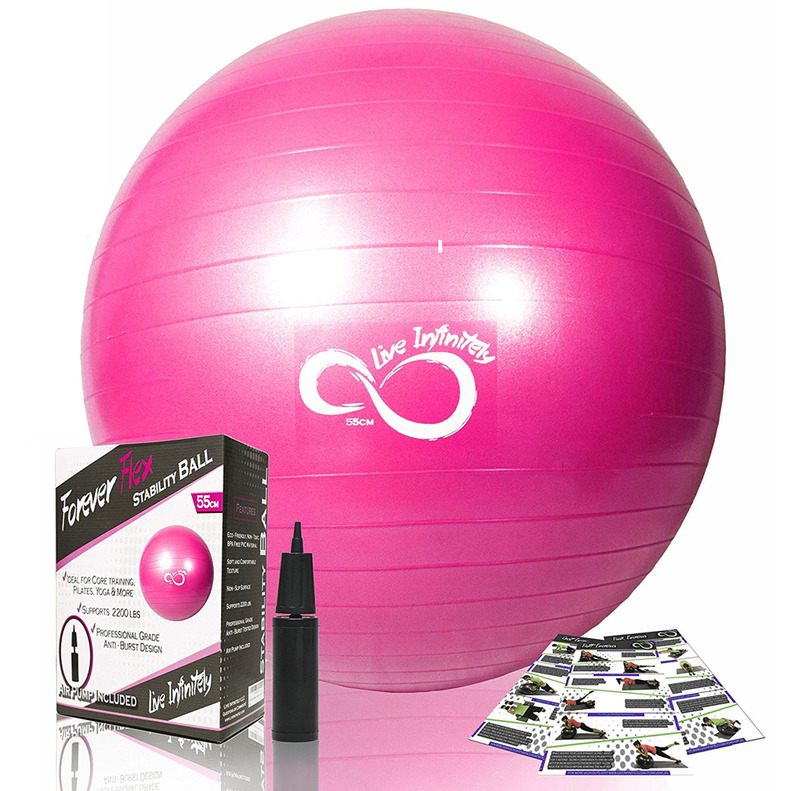 Spice up your yoga routine by adding in this Live Infinitely Exercise Ball. It comes in 5 colors and 4 sizes, and can withstand up to 2,200 pounds of static weight and 600 pounds of weight with an added force. As one of the sturdiest yoga balls on the market, it’s even durable enough to use as an office chair all day (which is a great way to improve posture and develop your back muscles). The setup for the Live Infinitely is simple: it comes with a pump that you can use to inflate the ball, and it even has an extra air plug and valve remover tool. You also get a digital guide with workouts and positions you can achieve with this ball. Whether you use this ball for yoga, pilates, high-intensity workouts, or low-impact activities, you’ll get extra support and stability as well as a challenge with new positions! If you didn’t read our article on yoga mats and don’t have a mat that keeps you from sliding around, then maybe you need some yoga socks. 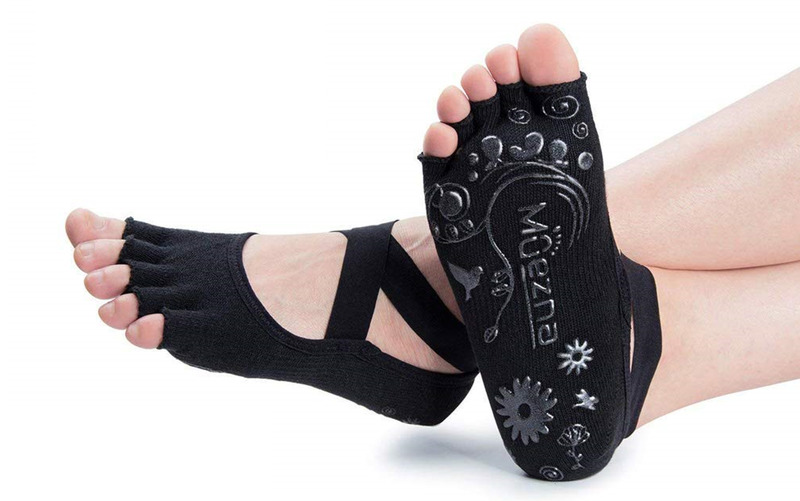 These cotton Muezna Non-Slip Yoga Socks have silicone gel grips on the soles, keeping your toes free and giving you more stability (as well as providing a better, more tactile feel). Not only does the toe design help your balance, but the toes are also separated which prevents athlete’s foot by limiting wick space for fungi to grow. You can do advanced moves in these socks without them slipping off or moving around since there are elastic straps that wrap over the top of your foot and behind your ankle. Plus, you can find the best fit by choosing between four different sizes. And don’t think you’re limited to yoga with these Muezna socks—you’re free to do pilates, ballet, boxing, tai chi, or any mat activity!